This scripting language avoids integrating analysis and display capabilities and instead focuses on providing precise and flexible control over the display of technical material. A look at the development and use of an open-source satellite-tracking and orbital-prediction program. CERN continues to use Linux as their OS of choice for modeling and simulation studies. This fully fuctioning prototype, designed and built by Steve Mann in 1998, was demonstrated in 1999, and later used to deliver a videoconference at ISSCC 2000. Professor Ortiz presents a little of the theory behind the three-tier architecture and shows how it may be applied using Linux, Java and MiniSQL. Always look on the bright side of life and at a method for debugging CGI programs on the command line. NM Tech studies lightning to determine basic charge structures and learn more about storm morphology. 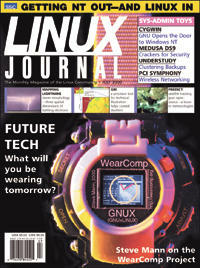 When you need an embedded operating system, Linux is a good place to start. Here's why. Troll Tech enters the embedded systems market—here's what's happening. LJ's French chef visits Montréal April 10-12 for more than the food. Take command of your log files by learning to handle those pesky logging dæmons. One programmer's experiece developing a Gameboy emulator on Linux. An overview of configuring Linux using Samba to replace the services provided from Windows NT servers. How to use the mechanism provided by the IA32 architecture for handling system calls. Looking at the skies for stars and aliens can both be done on Linux systems. No access to the Internet? Browse the Web via e-mail instead! The Astronomical Image Processing System looks at the sky using the radio wave section of the electromagnetic spectrum.